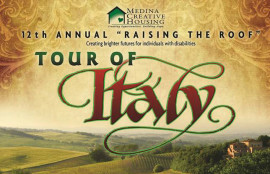 For a few hours, 375 enthusiastic attendees could forget about Ohio’s weird winter as they were greeted upon arrival by accordionist Bob Orlandi at Weymouth Country Club April 7 for a warm and welcoming “Tour of Italy,” the 12th annual “Raising the Roof” dinner and entertainment benefit presented by Medina Creative Housing. This much-anticipated social event offered an evening brimming with mouth-watering Italian foods, music by The Avanti Band, delightful comedic entertainment by the “Creative Comedy Crew,” raffles and gaming opportunities to win exciting prizes, and live and silent auctions featuring impressive items. “Duty-free” shopping featuring MCH coffee, dog biscuits, and more also was available. The food stations offered Italian varieties of soups, salads, pasta dishes, chicken, fish, and vegetable creations. Following the program, delicious desserts were served family-style at the tables; each table had a beautiful centerpiece created by committee members Diane Isaac and Kris Thomas.